Researchers from The Australian National University (ANU) have shed new light on how copper deposits form, in findings that could lead to new discoveries. The latest findings could help explorers in their search for new sources of copper and help make mines safer by identifying areas where sulfate salts form and weaken rocks. The research is part of a series of new international studies on how copper deposits form, published in Nature Geoscience. "Copper is one of the first metals that humans learnt to use and is still critical for many parts of our lives today, but until now it has been unclear how large copper deposits form and why sulfate salts are found in copper mines,” said co-lead researcher Dr Penelope King, from Research School of Earth Sciences (RSES). 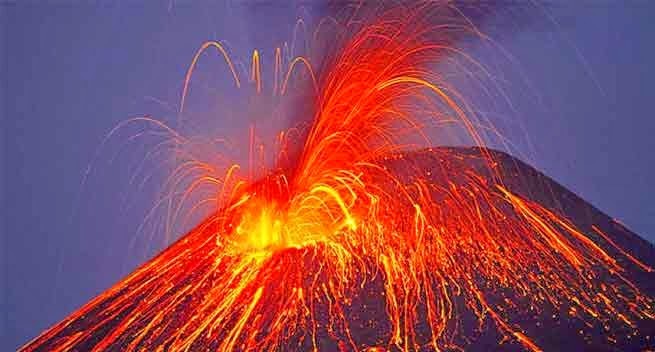 The new study shows that the pungent gases, common around volcanoes, react with rocks as they come up from deep within the Earth to concentrate copper and produce sulfate salts that are found in the porphyry copper deposits. This simple, one-step process is likely to be continuing inside active volcanoes like Yellowstone in the United States and on the North Island of New Zealand. Prior to this study, researchers thought liquids, not gases, formed the copper deposits and sulfate salts were just viewed as a significant problem for mines. The ANU team's research shows that when a hot gas expands from the heart of a volcano, it provides energy to deposit copper as well as sulfate salts. When the interior of the volcano is destroyed due to erosion or mining, the salts come in contact with water and dissolve. This causes the rocks to weaken which may result in the volcano or mine collapsing. Using the ANU findings, engineers will be able to predict the location of salt, which is important for understanding rock strength under extinct volcanoes and in copper mines.